Two years ago MB&F released their Legacy Machine Perpetual, a perpetual calendar with a new movement by Stephen McDonnell that used a patented ‘mechanical processor’, about which you can read at this link. This Legacy Machine features an integrated perpetual calendar, with a design that works on a 28 day (rather than 31 day) basis and skips past extra days via a date level that starts to ‘read’ the days when it hits the 25th day of the month. 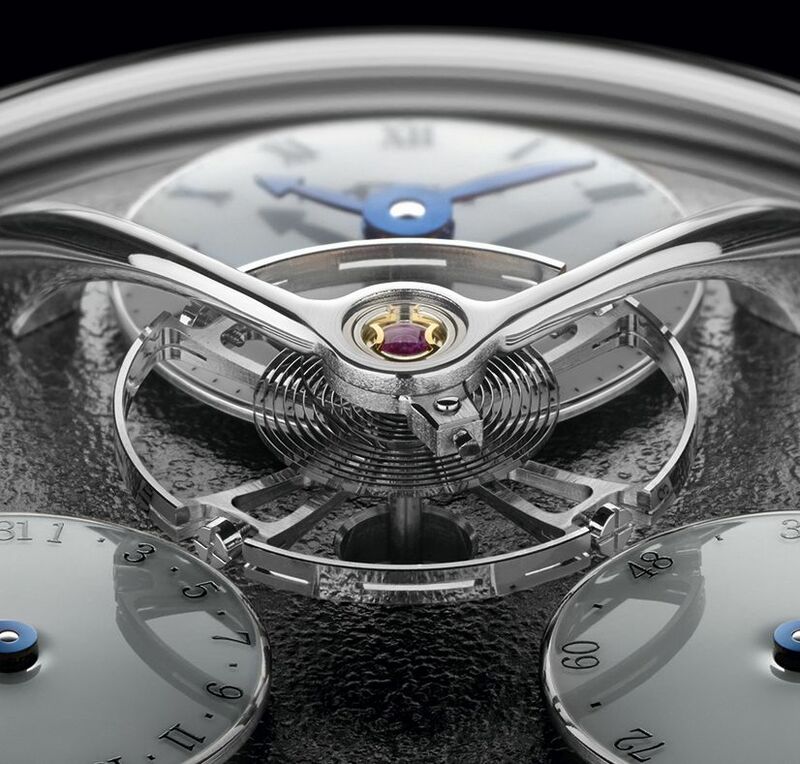 Now, MB&F have taken the base of this and created the new Legacy Machine Split Escapement. This latest limited edition watch is housed within an 18 carat 44m white gold case that has both brushed and polished finishing. 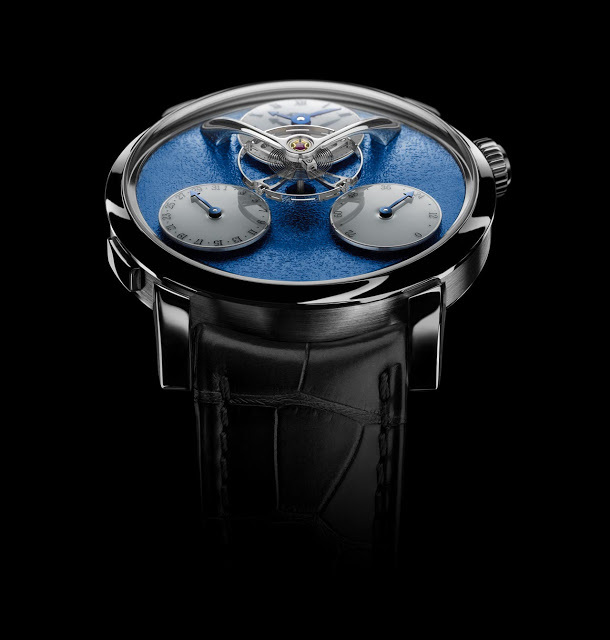 Underneath the sapphire crystal there is a frosted lacquer dial plate in blue, ruthenium, red gold, or yellow gold. These are created by the manual use of a wire brush on the surface to achieve the desired effect and finish before the colours are applied through PVD treatment. Each colour variant of the SE is limited to eighteen pieces each. There are then the three dials above these textured surfaces – the time at 12 o’clock, a power reserve indicator at 4 o’clock, and the date at 8 o’clock. The latter is adjusted via a pusher on the side of the case. Now, we come to that which looms over these, the suspended 14mm balance wheel which is one of the defining characteristics of the Legacy Machine collection. We also come to the new watch’s name. The balance wheel with traditional regulating screws but as per the Legacy Machine Perpetual, the escapement part (the anchor and escape wheel) are on the other side of the movement (hence ‘split’). The distance between the balance wheel and the impulse jewel is 11.78 mm i.e. the length of the arbour. The arbour itself is fitted at both ends with anti-shock jewel bearings and projects through the dial to support the oscillator. 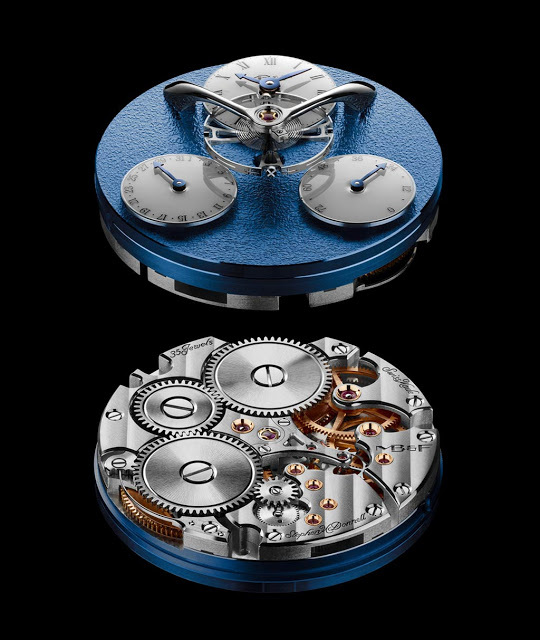 The double-barrelled Stephen McDonnell manual-wind movement that powers it has 35 jewels, 18,000 VPH and a power reserve of 72 hours. It is hand polished, bevelled, and features Côtes de Genève decoration. 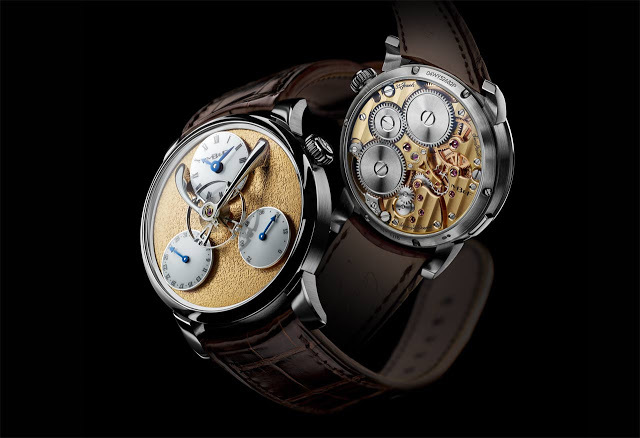 With this latest addition to the Legacy Machine series aka MB&F’s 21st century interpretation of classical watchmaking, the Split Escapement brings to the LM family a watch that fits neatly into the middle grouund between the Legacy Machine Perpetual and the earlier Legacy Machine horological forebears. The Legacy Machine Split Escapement comes on a 22mm black or brown hand-stitched alligator strap with an 18 carat white gold folding buckle. 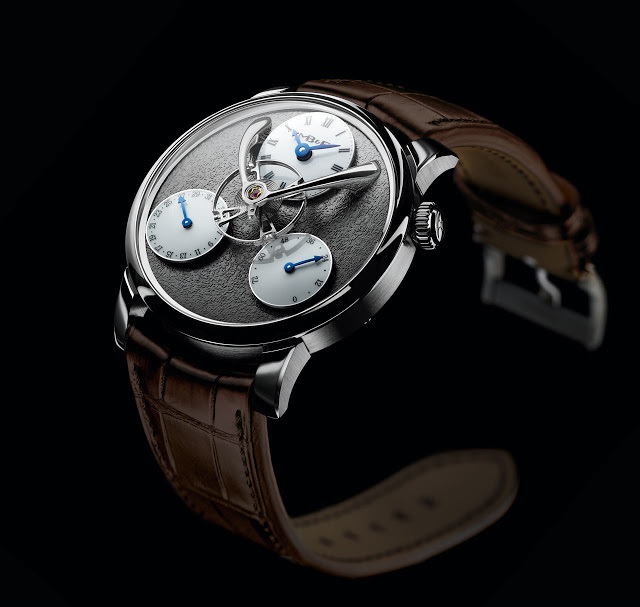 The RRP is CHF 85,400 (including VAT).